Police said the baby has life-threatening injuries. The 2-month-old son of a U.S, Navy sailor had 29 bone fractures when he was taken to Yale-New Haven Children’s Hospital and his father is being held on $500,000 bond after being charged with assaulting the baby. Jordan Rittenhouse, 24, of Groton, was arrested after police investigated a report of possible child abuse on Tuesday and found the baby with life-threatening injuries. Hospital officials said this is the worst case they have seen and authorities said they are surprised the baby is still alive. While Rittenhouse initially denied hurting his baby son, born June 21 in New London, he confessed when police confronted him with the extent of the infant's injuries. He admitted to police that he squeezed his son hard enough to make him stop crying around eight times over a three- to four-week span, according to the arrest warrant application. He also said he squeezed the baby under the armpits several times and was concerned on one occasion that he might have punctured a lung, according to court documents. When his infant son was fussy and did not want a bottle, Rittenhouse “shoved” the bottle in his mouth, causing the baby to bleed, according to police. He told police he was not concerned and explained it to his wife by saying the baby must have scratched himself. But his wife took the baby to Lawrence and Memorial Hospital in New London when she was concerned he wasn't eating properly. Hospital staff transferred him to Yale-New Haven Children's Hospital. Rittenhouse has been charged with first-degree assault and risk of injury to a minor and he is on suicide watch. Rittenhouse, who comes from rural North Carolina, is a seaman in the U.S. Navy and a student at the Naval Submarine School at Subase New London, according to Chris Zendan, a spokesperson for the sub base. 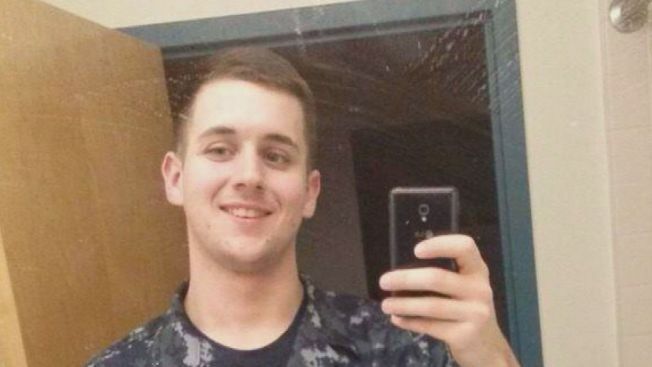 He enrolled in the Navy in November 2013 and reported to the school in January, Zendan said. Rittenhouse is not suspended from his naval duties and remains a student at the school, according to Zendan. Sources close to the investigation said the alleged assault happened at Rittenhouse's home on Deerwood Drive, part of a Navy housing complex in Groton. Neighbors said the allegations are shocking, but some acknowledged there may have been red flags. "It's very eerie knowing that this neighbor lives directly next door to us. It's very concerning as a parent," said Teddy McCarty, who has three children and whose husband is in the Navy. McCarty said Rittenhouse once aggressively yelled at his daughter when he found her playing with the water hose outside his house. Police said his daughter is 2 years old. "We hope that the father gets the help he needs and we pray to God that the son is well and that he never has to experience this again," said electronic technician seaman Nick Callands. Rittenhouse was originally held on $300,000 bond, but it was increased to $500,000 on Friday. Rittenhouse was ordered to have no contact with his family if he posts bail, but his public defender said he will not be able to pay it.